New for 2012 the Hayward DV5000 is a extremely quiet operating suction cleaner that works on your filtration system. Hayward’s design for the DV5000 is crucial to the success of its efficiency and quietness. They have created this cleaner with diaphragm technology which enables the cleaner to have its fantastic operation when in your Swimming Pool. DV5000’s installation is easy taking no longer then several minutes without the use of any tools. When installing this cleaner there is no need for any electrics or additional pumps as this will work from the suction generated from your filtrating systems. There is a minimum of a 0.75hp Swimming Pool Pump needed to create the best suction to make the cleaner work at top efficiency. Including in with this cleaner is a regulator valve that will set the ideal suction to maximise its peak performance. To operate the cleaner you connect hose to the main body of the cleaner and also attaching it to either your skimmer or vacuum point. 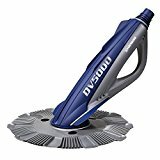 This creates suction from the filtration system through the hose down to your cleaner, this generates suction through the cleaner and enables movement for the DV5000 to travel around your pool floor and walls cleaning your debris. This entry was posted in Carpet Products and tagged automatic, cleaner, DV5000, Hayward, Pool, Suction, Swimming by Carpet Cleaning Tips. Bookmark the permalink.